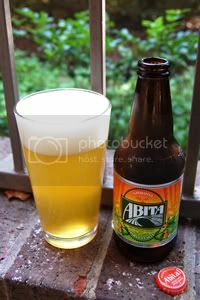 For my first review of an Abita product, I decided to go with something a little oddball, their Strawberry Harvest Lager. Well, it was interesting enough that when I saw another of their Harvest series, I went for it. Pale and cloudy, like the haze on a hot summer day, this white beer has a sweet and subtle citrus flavor with a touch of spice that is cool and refreshing. Sounds pretty appetizing, let's check it out. Appearance: A nicely hazy golden body capped with a finger and a half of creamy, off-white head that features good retention and lacing. On point for the Witbier style. Aroma: It certainly smells like a Wit too with lots of yeasty, doughy and bready notes. There's not that much in the way of citrus, but maybe it will be more prominent in the flavor profile. Taste: Classic Wit flavors of bready, doughy wheat malt dominate, though it's missing a lot of the spice found in the Beligian originals. In the absence of spices, the citrus character that is usually derived from orange peel is amped up and somewhat jucier. The citrus flavor may be somewhat subtle, but it's there, especially towards the end. The aftertaste is bready with a trace of juicy citrus. Mouthfeel: Medium bodied with good carbonation and a dry finish. Drinkability: Certainly a quaffable and nicely refreshing brew. Verdict: Satsuma Harvest Wit is a serviceable Wit with a nice splash of citrus, just don't go in expecting a brew that's infused with bold orange juice. Note: While this review is being published in January, the tasting notes contained within were taken when the beer was fresh last July.